"I am very satisfied with the software and support. Reserve Analyst is easy to use. It is very flexible with math models, photos, report format and customization ability! Most important benefit is ease of use and spell check. Reserve Analyst is excellent software and current upgrades are great!" Reserve Analyst© is the premium reserve study software on the market today. Serving the industry for over 16 years, Reserve Analyst© is the most powerful and flexible modern Windows© software application in the industry. With clients in over 35 states and four countries Reserve Analyst© serves the broad market of reserve study software users. From the Single Community to the Reserve Professional and everything in between. We encourage our family of satisfied users to be part of the process by providing feedback for new and enhanced features. Reserve Analyst© is continually being updated and upgraded with new features and benefits added all the time. Premium Toll Free Support is the norm with Reserve Analyst© and we genuinely want you to get the most out of your reserve study software application. We are dedicated to excellent software and superior support! 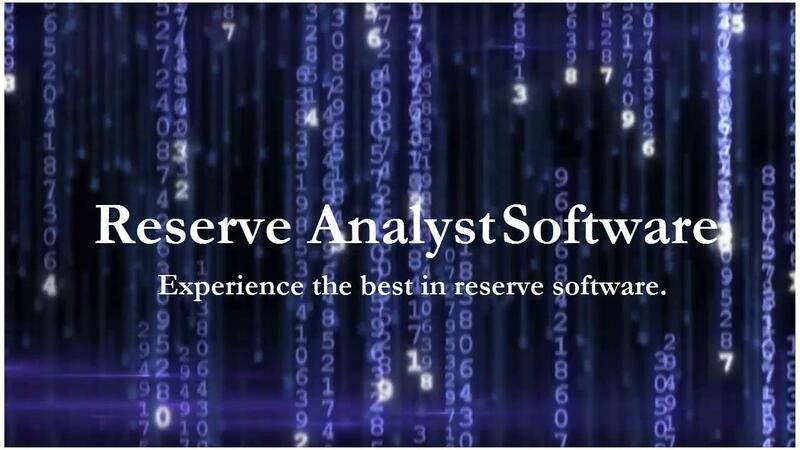 Reserve Analyst© is the Answer for Your Reserve Software Needs! Clients like you have been getting their reserve software from us for 11 years. Here's just 3 reasons why they love it. 1.) Get Everything You Need From Your Reserve Software: You'll save time and money when you make one call to get started with Reserve Analyst© software and discover how powerful and flexible your reserve study can be. 2.) You Get Exceptional Client Service: We offer above and beyond customer support through our toll free number 800-561-0173 and direct, one-on-one, assistance with our remote help module. Help is available at your convenience, even on weekends. 3.) Become Part Of The Process With New Features: We have fostered a culture where we encourage our clients to be part of the process in recommending new software features. Speak directly to the programmer to discuss individual needs or offer suggestions on how to make current features better. When new features are added all clients benefit. Why not find out for yourself. Give me just 23 minutes of your time and I'll show you what we can do for your reserve study. You won't get a high pressure sales pitch. I have those as much as you do. What you will get is solid, constructive information to help you understand more about your reserve study preparation options. Call TODAY at 800-561-0173 and let us be your software solution! How will you use Reserve Analyst? I'm a community association board member. I'm a CPA working for community associations. I'm an engineer who prepares reserve studies. I'm a professional reserve provider.